Death Toll Climbs In Congo Ebola Outbreak : Shots - Health News The number of deaths from an Ebola outbreak in the Democratic Republic of Congo surged in the past week, prompting concern that the outbreak was spreading. A spokesman from the World Health Organization says the outbreak is not out of control. A medical worker from the U.S. Centers for Disease Control and Prevention works at the laboratory in Uganda where Ebola specimens were tested at the start of the latest outbreak in the Democratic Republic of Congo. As health workers try to contain an Ebola outbreak in the Democratic Republic of the Congo, the death toll has increased to 31. The deaths from the hemorrhagic fever outbreak doubled in the past week. World Health Organization spokesman Tarik Jasarevic tells Shots that's because they have discovered more people who were originally infected. "We can expect an increase in the number of cases as more people are tracked. These are not necessarily new cases," Jasarevic says. "I want to stress that this is a serious outbreak, and there is a risk of the Ebola virus spreading, but we would not say that it's out of control.". Earlier Thursday, another WHO spokesman, who is in Congo's capital city, told Reuters the outbreak was "out of control" and "if nothing is done now, the disease will reach other places, and even major towns will be threatened." In contrast, Jasarevic says "it is being dealt with" and that all measures have been put in place to stop the outbreak. The WHO has been working with the Congo's health ministry and nonprofit groups to treat those infected, locate people they were in contact with and to quarantine suspected cases. 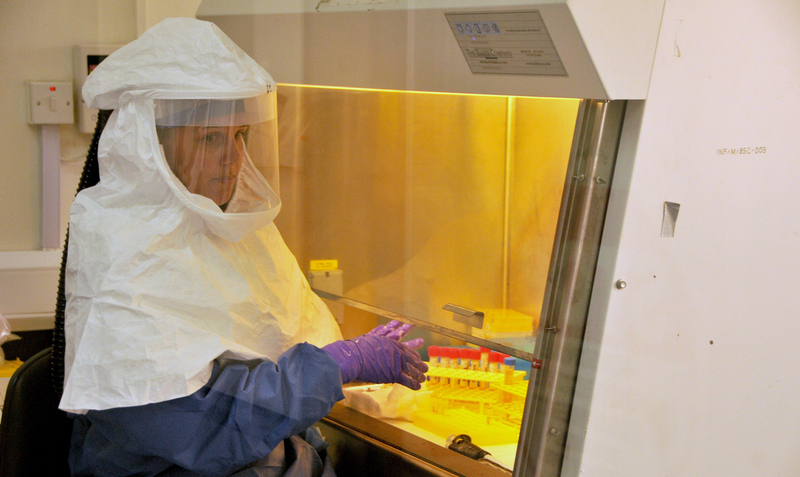 The U.S. Centers for Disease and Prevention established a field laboratory on the scene for testing infections. The outbreak was first reported to WHO on Aug. 17, with 10 cases and 6 deaths. By Sept. 3, the number of people infected had increased to 28 cases and 14 deaths. The infections first appeared near Isiro, a city with a population of about 150,000 in the northeast. The outbreak then spread to a second town about 50 miles away when a woman caught the virus at a funeral for an Ebola victim. The Congo has had eight previous Ebola outbreak since 1976, including one in 2007 that killed almost 200 people. This current outbreak comes on the heels of one in Uganda in July that claimed the lives of 17 people. The CDC confirmed that the two outbreaks aren't connected because they were caused by different kinds of Ebola. In the Congo, infections are due to Ebola-Bundibugyo, a subtype which had a death rate of about 34 percent in a past outbreak. Although there isn't a cure or vaccine for Ebola, patients can be treated for some symptoms, such as fever, vomiting, diarrhea and dehydration.